This Lean Six Sigma Green Belt training is a interactive workshop to discover how Lean management refers to process optimization and waste elimination; and how Six Sigma projects are connected to quality improvement and client satisfaction. After this 6 day program you will pass the certification exam and act like a certified Lean Six Sigma Green Belt member. This Lean Six Sigma Green Belt training is a structured and disciplined management method based on process improvement targeting quality. We will teach you a method that aims at reducing the risk of going outside of the client’s expectations by delivering perfect products and services on a consistent basis. It will focus on all types of processes owing to organization complexity and process internalization. This training is divided into two parts. The lean management part (2 days) of the training refers to value preservation focusing on eliminating non-value added (waste) resources or activities. The Six Sigma part (4 days) is a set of techniques and tools used for process improvement. Kicking our Lean Six Sigma Green Belt training off with a little story about Lean principles and TPS (Toyota Production System) shows you the Eastern way of thinking in improving processes. The two days are focused on a Lego Serious Play Production Plant Business Game helping you to understand Lean tools like the Value Stream Map. In this part you will understand value preservation focusing on eliminating non-value added resources or activities (waste) and a set of techniques and tools used for process improvement. Serious game: the group experiments in the classroom the Lean improvement method (Kaizen Event) on a role play simulating an end-to-end business process (receipt of orders, processing, billing, shipping). Serious game: In-class experimentation of the method on a service level improvement case (paper flying machines). Using the Minitab 18 Software. Our training and business games use teaching methods which focus on the mental, physical and emotional development of participants. Their contents are specifically tailored to the training goals and the participants. Our teaching methods are both participatory and collaborative, involving problem solving, role-playing and serious games. Therefore they offer motivating challenges and stimulate participants to invest in their training. We partner with clients from the private, public, and non-profit sectors in Belgium and abroad to develop their Lean Six Sigma skills, address their most critical quality and process improvement issues. Our customized consulting, learning and development approach implements the Lean Six Sigma insights at all levels of your organization. This ensures you to achieve sustainable continuous improvement in your efficiency, quality, people, cost, customer satisfaction and revenue issues. Our service extends beyond our work: we promote the exchange of expertise between our consultants and your organization. We believe that co-creation between us is key to the success of your operational excellence challenges. Through the development of these synergies, we ensure your people to master Lean Six Sigma philosophy and to run it afterwards. Prerequisite: None. It is recommended to have preliminarily followed the Training Lean Six Sigma Yellow Belt. 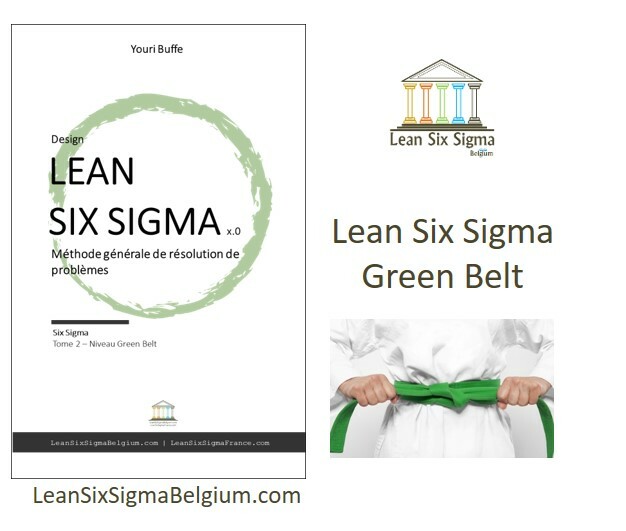 Lean Six Sigma Belgium prepare you to pass various types of certifications ABPMP® (175€), LSSB (175€), ASQ (see website) or IASSC™. Please contact us to select the right certification and for further information. Lean Six Sigma Belgium is an IASSC accredited organization. IASSC™ Accreditation does not constitute its’ approval or recognition of our own lean six sigma certification program. The only method to earn an IASSC certification is to successfully sit for and pass an official IASSC certification™ exam. We only upon request administer or provide access to IASSC Certification exams for an additional cost of 295$ Green Belt. IASSC only recognize the Lean Six Sigma Green Belt 7 day program and not the 4 days. 42 hours in classroom + 4 hours preparation (pre-reading + online introduction training) + 6 hours homework and study + 12 hours reading of 2 books + 12 hours coaching (optional practical assignment). Subscription, information, quotation or expert call back.